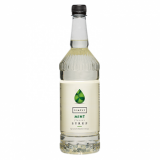 Monin Green Mint (Menthe Verte in French) syrup in stylish 70cl glass bottle. According to Greek Mythology, 'Menthe' was a water nymph who fell in love with Hades, Persephone's husband. Jealous goodness turned the nymph into a green plant, today famous for its deliciously, fresh sweet aroma. Mint is aromatic and pleasant. Its refreshing and cooling proprieties make Green Mint one of the most appreciated and used herb in worldwide salty cuisine as well as confections. Green Mint is traditionally used in France to flavour water and in Italy to accent cold milk. In the U.S., versatile Monin Green Mint is ideal to give a cool peppermint taste and green colour to smooth and chilled beverages. Applications: Cocktails, chocolates, mochas, flavoured milks, sodas, teas, lemonades. Sugar, water, natural mint flavouring, flavouring, colouring agent: E133. Sorry - We are out of stock of Monin Syrup - Green Mint (70cl).